No matter where they live or work, health professionals, researchers and the public can access information from the National Library of Medicine thanks to its National Network of Libraries of Medicine (NN/LM), consisting of more than 6,000 libraries coordinated by the NLM and supported by eight Regional Medical Libraries (RMLs). 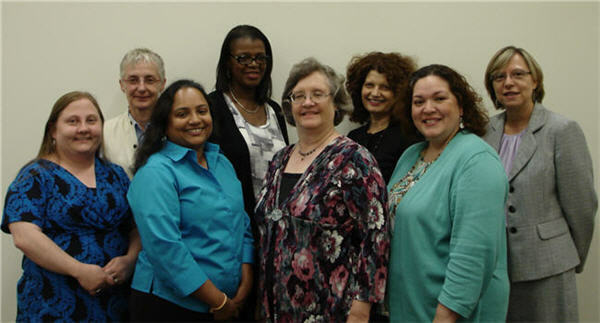 NLM in Focus is showcasing the libraries awarded contracts to serve as RMLs for 2011-2016. In this article we introduce you to the people and projects of the Greater Midwest Region (GMR). Split by the mighty Mississippi River and supporting 10 states, the Greater Midwest Regional (GMR) library network is one of the most populous in the NN/LM, serving more than 1,100 network members. The GMR meets the challenges of serving Chicago, the nation’s third largest city, as well as thousands of sparsely populated rural areas, by offering a wide variety of programs. The GMR is headquartered at the University of Illinois at Chicago, Library of the Health Sciences. It supports 31 regional resource libraries selected for their collections and special expertise (15 of them designated outreach libraries), and information centers located across Illinois, Indiana, Iowa, Kentucky, Michigan, Minnesota, North Dakota, Ohio, South Dakota, and Wisconsin. NLM in Focus spoke recently with GMR Director Kathryn Carpenter, and Ruth Holst, who has since retired as Associate Director. Her successor, Beth Layton, contributed greatly. Our region’s size and diversity is challenging but stimulating. We serve nine of the 50 largest cities in the country: Chicago, the “three Cs” of Ohio (Cincinnati, Cleveland, and Columbus), and Detroit, Indianapolis, Louisville, Milwaukee, and Minneapolis. We also have great expanses of rural farmlands, plus frontier regions such as parts of the Dakotas with isolated populations. There are Hispanics, expanding immigrant populations, large rural Native American communities and, in Detroit, a significant Arab enclave. Our region is full of cultural diversity. The biggest challenge is geography. 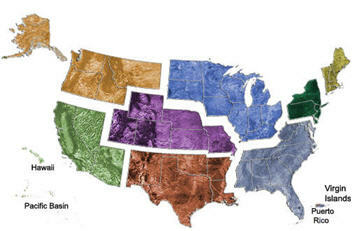 We have 10 states and nearly 20 percent of the US population. More than 22 percent of the country’s hospital libraries are located in our region. Each state has a traveling coordinator, but they face long distances and grueling travel times. In order to reach the populations most in need of better access to health information, we rely on local librarians. Therefore, most of our programming focuses on the professional development and support of librarians and other professionals, who are the intermediaries to the people in their areas. Our resource libraries are key helpers in delivering statewide programs. This can be tricky, given the region’s immense diversity. Another of our hurdles is that hospital libraries are closing throughout the region. To help stem the tide of closings, we’re working with librarians so that they can educate hospital administrators and help them realize, value, and save these essential resources and services. We have three priorities: support and advocate for hospital libraries; work with health professionals and librarians to provide quality health information; and expand health literacy and awareness. We support hospital libraries through educational sessions. For example, in February 2013, we partnered with the MidContinental Region to explore how knowledge management and transfer apply to a hospital/health system environment. Successful projects have been reported as follow-up activities including a new project with the goal of identifying ways to strengthen the hospital environment around quality and safety. We offer classes for hospital librarians including the “Patient Safety Resource Seminar,” an interactive seminar that focuses on ways librarians can become more involved in patient safety processes and activities, and “Measuring What Matters to Stakeholders,” a class that helps librarians identify and assess issues of importance, incorporate measurement into the strategic planning process, and communicate with decision makers. We exhibit throughout the region to health care professionals and librarians providing displays and materials for member libraries. Our biggest effort there is the annual exhibit at the Radiological Society of North America (RSNA), an international society of radiologists, medical physicists and other medical professionals.Through this long standing partnership, health professionals learn how to find quality information through NLM resources or by stopping by the exhibit and demonstration booth funded by RSNA. Because of the changes in technology and in information resources, librarians need continuing education in order to respond to changes in health care and health information resources. Recently, we identified the need to educate librarians in the systematic review process. With our backing, a group of medical librarians at the University of Michigan developed a systematic reviews course and has offered it twice to librarians throughout the region. A systematic review tries to identify, appraise, select and synthesize all high quality research evidence relevant to a focused research question. Systematic reviews are critical to evidence-based medicine. A multidisciplinary team that includes a librarian usually conducts the review, so a knowledgeable librarian who understands the systematic review process and how to find information in varied bibliographic databases is crucial. The Michigan version uses a “flipped classroom” model that combines an online component (done over a period of two weeks) with a two-day in-person component, making it more affordable and accessible than the more typical four full-day courses. Since attendees only have to be away from work on those days, people who could not attend a longer course may be able to attend this version. To increase health literacy, we funded a project with Kentucky Health Literacy for the Community, in collaboration with the Health Literacy Kentucky multidisciplinary coalition. It involved setting up four regional centers across the state to teach members at various community organizations to communicate more effectively with their healthcare team. During the project, 427 Kentuckians attended the presentation in 28 different sessions. Evaluations indicate an increased awareness of health literacy issues and the NLM online consumer health information resource, MedlinePlus. To increase awareness of health resources, we respond to requests from public libraries and supply assistance to patrons seeking help with the Affordable Care Act (ACA). We reached at least 700 people directly with sessions within the region and identified information resources for the 10 state region, though the impact was much broader since people returned to their libraries and helped others understand the ACA. NLM in Focus: How has technology impacted your work? ugh monthly webinars in topics as varied as the NLM exhibit program and consumer health information resources about animals. Although we’ve converted many face-to-face classes into online sessions, we still believe in face-to-face contact with librarians and consumers through classes, state and local meetings, and site visits to libraries. During site visits, library coordinators see the results of funded projects and gain a better understanding of the local library environments. We use email, Facebook, Twitter, and our blog, The Cornflower, to communicate with members. It may sound strange, but most of our clients prefer email. An important aspect of the GMR program is technology awareness. We help members learn about new technology. We coordinate a technology forum at the annual regional Medical Library Association meeting; this year the title is “Trends in Mobile Technology.” We also have a mobile “petting zoo” so that librarians may touch and try the devices at exhibits or during classes. We serve a large Arab population in Detroit, conduct outreach to a significant Hmong community in Wausau, Wisconsin, and maintain outreach to our Native American and Hispanic populations. Our outreach extends from our inner cities to the far stretches of farmlands and prairies. The GMR funds 15 outreach libraries; these libraries go where we can’t go and better understand the needs and environment of the state. Outreach libraries activities range from exhibiting at local events; teaching consumers about health information; teaching information literacy skills to high school students; developing Web pages to link consumers to information; and partnering with health care providers on projects to reach underserved populations. One of our proudest accomplishments is our collaboration with the Heartland Alliance, perhaps the leading anti-poverty organization in the Midwest. They are dedicated, as are we, to working with immigrant and refugee groups, and advocating for health and safety programs for these people in need, including the homeless. The four big problems we try to attack are affordable housing, healthcare, jobs, and justice. And of course, poverty makes all of these problems much worse. One of our recent projects involved increasing access to electronic health information for survivors of torture. We partnered with the Heartland Alliance and the University of Illinois at Chicago, Library of the Health Sciences and their outreach librarians to introduce high-quality, multilingual electronic health information to survivors of torture and the staff and volunteers who serve them. From the start, we realized that even staff and medical professionals working with the survivors were unaware of most of these materials. So the project had an immediate, helpful impact. The survivors were impressed and pleased with the number of resources available to them in their own languages, and felt supported in their efforts at rehabilitation, independence and empowerment. We are trying to impact people’s health through access to health information. We see ourselves as collaborators whose successes occur when our members join together with colleagues in environments that may include health care providers, health associations and the residents of the 10-state region. Many of our successes occur when the GMR and the members of the Midwest Region of the National Network of Libraries of Medicine collaborate. The value of these collaborations is immeasurable in improving health through information. Greater Midwest Region staff photo (back row, l-r) Jacqueline Leskovec, Irene Williams, Kathryn Carpenter, Beth Layton (front row, l-r) Tiffany Tawzer, Samanthi Hewakapuge, Holly Ann Burt, Rosalva Medina. August 26, 2014 in Programs & Services.